A couple of weeks ago Acuity Brands launched new editions of their OLED luminaries with the latest LG Chem panels. A day later the company published a video showcasing those luminaires and explaining how perfect those OLED panels are. Q: Acuity has been working with OLEDs for some years now. Can you tell us why you have adopted this lighting source so early? Acuity Brands, as a North American market leader and one of the world's leading providers of lighting solutions for both indoor and outdoor applications, is always on the lookout for new technologies that can enhance people’s lives where they work, live and play. As a fully integrated lighting solutions provider, Acuity Brands bring focuses on innovative lighting solutions and advanced solid-state technology that can seamlessly integrate with powerful digital controls and daylighting to create greater energy efficiencies and a higher quality of light. Early on, the potential for OLED Lighting and its synergies with our overall company objectives made OLED a key area of investment for Acuity Brands to create clear brand preference with designer, customers and end-users and become the pre-eminent OLED lighting solutions provider. We believe that by bringing exciting lighting solutions to market, demonstrating technology & innovation leadership, and acting as the clear champion for OLED lighting, OLED Lighting will reach its full potential. Q: Can you tell us anything regarding customer reaction to your OLED luminaries? 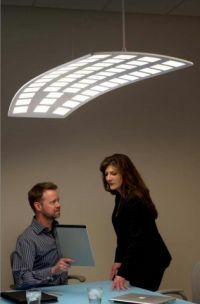 From the very first OLED luminaire concepts we demonstrated in 2010, our customers have been wowed. Customers consider our OLED luminaire concepts revolutionary and inspirational, commenting on how the designs are modern and innovative. In the beginning, we were focused on demonstrating OLED luminaires as concepts because the technology was so new and relatively unknown. So, up until recently, OLED was viewed as lighting for the future. With the introduction of our next-generation OLED luminaries, we are showing our customers that OLED lighting is applicable now. The performance of OLED lighting technology has advanced in several key ways (namely lifetime and color quality) which allow broader adoption and usage. Our customers are now considering OLED lighting on projects they are working on today while being inspired by the design freedom and creativity that our OLED luminaires afford. Q: Currently the OLED lighting technology is advancing in several fronts - efficiency, panel size, color-tunability, color quality (CRI), flexibility and transparency. What are the most important aspects for you guys as designers? As luminaire designers, all of these advancements are important, and all of these advancements are important to our customers. The key is matching the right set of attributes to the application. For example, panel size would allow for different luminaire design aesthetics, the creation of different scale luminaires, or straightforward construction of certain types of close-to user luminaires such as task lights and undercabinet lighting systems. Efficiency becomes important as we look to apply OLED lighting for ambient lighting for large spaces. 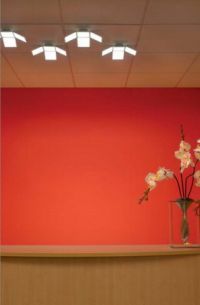 Color-tunability is an attribute we see as broadening applications in user-responsive and interactive lighting systems, a growing trend particularly in healthcare, residential, and corporate interiors. Flexibility allows even more creativity in design and expands the ways in which an OLED luminaire may be defined as a luminaire. Finally, transparency is quite intriguing, and we see demand for this once some of the performance limitations are solved. Like us, our customers see our vision that OLED offers commercially available choices that are not available today. They also see that OLED will be able to offer value propositions that cannot be matched by what is available through other light sources in terms of design creativity and application for direct-view light sources, resulting in more choices for them as designers and ultimately for their clients. This includes transparent OLED panels, dynamic OLED panels, and truly flexible panels. We see that spaces will be illuminated in new and novel ways unconstrained by limitations of current built environments, such as through integration of lighting with architecture and furniture and the integration of personal and interactive control. These new application possibilities will bring lighting closer to the user and accelerate the adoption of OLED lighting through greater appreciation of the light. The opportunities could be endless depending on where the technology takes us. Cost is another important consideration. In five years, we believe costs for OLED panels could be a 10th of what they are today (or less) featuring lifetimes of greater than 50,000 hours and efficacy of greater than 120 lm/watt. Such improvements will allow for broader application of OLED in more applications. Q: When do you see OLEDs starting to enter more markets beside the premium luminaire one? When do you expect to release residential and office lighting that are more affordable? We believe that OLED lighting has already entered markets beyond the luxury/premium luminaire market. We see that OLED lighting positioned in the architectural lighting market today for certain applications whether it’s statement spaces or accent lighting. Again, depending on the design and application, OLED lighting is a very viable alternative to architectural LED-based lighting products. Q: We know you are using LG Chem panels. I wonder if you can say why you chose their panels over the competition? We work with all of the leading suppliers of OLED technology. In our next-generation commercially available luminaires by Winona lighting (Revel™, Kindred™, Trilia™, and Canvis™) as well as the forthcoming introduction of the Nomi™ sconce family, we selected LG Chem for their ability to meet our selective performance targets. This includes exceptional color-quality, long-life, and reliability. LG Chem is also the first supplier to bring to market a commercially available bendable OLED panel, which we will feature in our Nomi sconce family. We are very excited about our new luminaire innovations and to work with a partner like LG Chem who continues to advance OLED technology. We are particularly enthusiastic about what’s next on the horizon both from LG Chem and other OLED lighting technology suppliers. This includes many new form factors available both in white, static color, and dynamic color using rigid, bendable, and flexible panels. We expect the leading OLED panel suppliers to continue to improve performance with more efficacious panels, longer-life, and competitive costs. We also expect to see a broader availability of electronics including drivers and controls specifically designed for OLED lighting applications.